WHITMAN — Her husband always had a poised personality. He was a devoted father, a happy, caring individual, amused by life and family, but she eventually noticed something was ever so slightly altered about his normally laid-back demeanor. His primary care doctor referred him to a neurologist after he also observed fluctuations and a change in physical movement. Bruce Waugh lived nearly a decade with Parkinson’s disease after his diagnosis in 2005. He kept active and kept moving — key components to longevity in delaying the progression of Parkinson’s disease. His wife Priscilla observed the one-year anniversary of her husband’s passing in August. It was a time of celebration and memories with family but also a time of healing. She has missed him greatly this past year, she said. The “Waugh-riors” will also be moving for Parkinson’s disease and in honor of Bruce next weekend as a group of 21 strong. Moving Day-Boston will be held on Saturday, October 11th, 2014 at Artesani Park, 1255 Soldiers Field Road, Boston. With 50 teams registered for the event, there will be numerous activities to inspire moving the body (known to extend the lives of those afflicted with Parkinson’s). Physical activity is key to keeping the muscles strong and delaying deterioration, according to the official Parkinson’s disease website. They had a life full of love, laughter and adventure Priscilla recalled about the first time they drove down Washington Street in Whitman in 1968. “I remember him saying ‘I’m home,’” she said. Indeed, they were home. They planted their roots and celebrated 53 years of marriage in Whitman where they raised three children and welcomed grandchildren as the years went by. He spent 28 years working at Pneumatic Scale of North Quincy and eventually as the recession brought change in 1982 he found permanent employment as the full-time assessor for the town of Whitman. He held the position from 1982 through his retirement in 2002. Waugh also volunteered over the years on various boards before becoming an elected member of the Board of Assessors. Priscilla realized that her husband’s physical therapy sessions were keeping him strong. They fought the disease together through sickness and health. 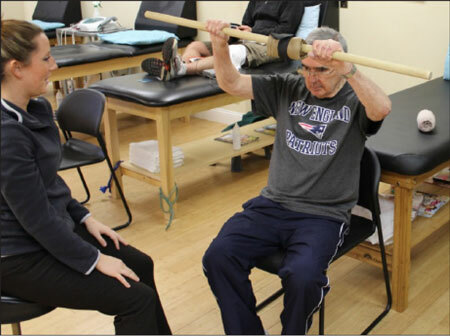 Physical therapy sessions included strength exercises for the arms and legs, tossing and catching a ball for eye hand coordination and other various movements for day to day living. Waugh also had a heart attack, which affected the progression of his Parkinson’s disease. As the sole care giver of a loved one with Parkinson’s there are many aspects of adjustment. Personal care, healthy, proper eating and day-to-day changes that occur with the progression of the disease are challenges a caregiver undertakes. When some days are more challenging Waugh gives this advice to other caregivers. “You are as strong as you need to be at the moment,” she said. “A new day arrives and it’s fine. You, in some ways, put your life on hold and you do it lovingly. But like myself, I wouldn’t have it any other way,” she said. One of their sons, David Waugh, who now resides in Florida will be taking part in the Miami “Moving Day,” event Oct. 5. He is the IT manager for the National Parkinson’s Foundation located in Miami. He is also among the travelers who will attend the Keep Moving-Boston event on Oct. 11. “In the United States, 50,000-60,000 new cases of PD are diagnosed each year, adding to the one million people who currently have PD. The Center for Disease control rated complications from Parkinson’s disease as the 14th leading cause of death in the United States. Worldwide, it is estimated that four to six million people suffer from the condition,” according to the Parkinson’s disease nationwide website. For more information on the disease, visit Parkinson.org. Moving Day is the National Parkinson Foundation’s annual fundraising walk/run event. It is a fun and inspiring fundraising event that unites families, friends and communities both large and small in the fight against Parkinson’s disease. This celebration of movement will feature a family friendly walk course, a kids area, a caregivers relaxation tent and a special Movement Pavilion featuring yoga, dance, Tai Chi, Pilates, etc. all proven to help manage the symptoms of PD.